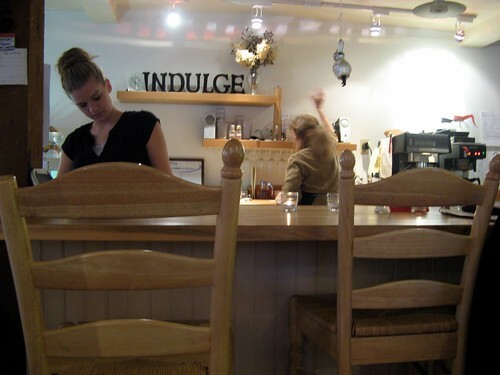 indulge, originally uploaded by jahansell. I probably spend more time out and about in Salisbury than I do in Sharon. At the moment, Sharon has lost 2 of its 3 restaurants and the one that's left serves only pizza - it's good pizza but it's not a place to go sit and hang out. In fact ours is now the only town around without a coffee shop - a place to see neighbors, get a muffin or soup or some eggs on a roll or just sit and read the paper. These places are where a community comes alive. I wish someone would take over the Country Corner or the former Papardelle and create that perfect place, the one you are drawn to, with reasonable prices, long hours, great coffee, sinful sweets, healthy alternatives, and friendly responsive staff. Until that place comes to Sharon, I will keep going to the Country Bistro in Salisbury, my twice-a-week hangout. While each daughter is in ballet I take the other to Holly's fine establishment, where I can get a cream puff, carrot-ginger soup, or lentil salad, chat with whoever stops in, and while away a pleasant hour. It's just perfect. I'll be sharing a few more photos of a walk around Salisbury in the next few days. was just at country bistro on saturday. Great coffee and almond croissants! Yes, Sharon REALLY needs a local coffee shop. Until then, it's Salisbury or Millerton. Yes, it's nice to have a place to hang out; we've just gotten one here in the past year, and my knitters' group has even gotten Reserved table status on Saturday morning!